Includes (Basics Only Bali) airfare, airport transfers and hotel only. *Both price and availability are subject to change and are not guaranteed until completed through the booking process. See Pricing information at bottom of the page for more information. *Irene O’Neill’s professional fees are not included in package pricing. A lover of self-exploration and deep personal work, Irene serves as path-finder for her clients on their own journey to self-discovery and fulfillment. She offers a space free of judgment and advice and instead uses compassion and curiosity to help her clients explore their challenges, fears, desires, and hearts longing. Through this work, clients gain insight and perspective to lead their life with confidence and purpose. Irene believes that in experiencing and being with what is happening now, the path forward opens with ease. She uses a methodology that equally focuses on who we are in addition to what we do, because one informs and impacts the other. Irene is a certified Co-Active Professional coach and has completed advanced coaching training with Coaches Training Institute, one of the oldest and most well-known coaching schools. Irene is also an Accredited Certified coach with the International Coaching Federation. She has completed advanced trainings in Biodynamic Cranial Sacral Therapy (4 modules), Avatar which focuses on living deliberately, and frequently draws from her own deep soul-searching work of more than 25 years. Irene holds a BA in Communications and in addition to her coaching business, Irene has more than 7 years of experience working as a facilitator, trainer, and coach in the realms of Leadership Development and Employee Engagement. She helps leaders live their highest potential, create high performing teams and create an environment where employees thrive. 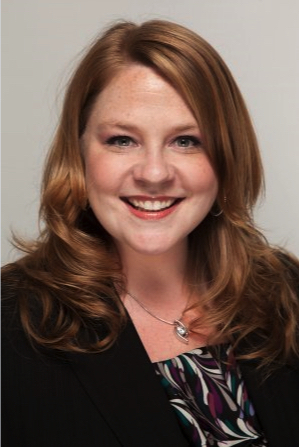 She is certified in several leadership trainings including Crucial Conversations, Influencer, and Getting Things Done. She’s a professional member of the Association for Talent Development, Toastmasters, and serves on the board for her loving and inclusive church. During the day, you will enjoy a combination of the offerings of the Four Seasons, and the healing and meditation sessions at Fivelements. The art of traveling is an act of letting go. At Fivelements, we believe traveling through Bali can present once-in-a-lifetime experiences that open the heart, mind and soul and nurture personal growth and healing. Inspired by this belief and supported by our collective experience on the Island of the Gods, we have developed a selection of unique customizable one-to-five day Healing Journeys. You will depart CMH at 6am and travel in Business class to DPS via United Airlines and Singapore Airlines. You will arrive in Bali (DPS) around 9pm (local time) and meet your private driver to take you to the Four Seasons Bali at Sayan. Your room will be a Duplex Suite for the next 12 days. Embracing Change is an invitation to a powerful journey of self-discovery. During this counseling session you are held a safe, confidential sacred space for honest expression of whatever is most pressing in your life. Within this field of love, all emotions are welcome without judgement, and deep, lasting transformation is possible. During the process of deep listening and insightful inquiry, we create together a pathway for old emotional blocks, traumas, and conflicts to begin dissolving, and the authentic self to unfold. The session may include mindfulness, breath work, meditation, visualization or visioning, beginning and ending in an affirmation. Om in Sanskrit symbolizes the universal vibration of peace. With shraddha (devotion), Putu offers jyotir (light) and blessings in this heart-felt session. You begin with a cleansing bath ritual with Balinese salts, betel nut leaves and golden flowers. Then, chanting sanskrit mantras over an intimate fire offering, accompanied by vibrational sound of the singing bowl, Putu invokes healing, harmony and peace from higher spirit. Energy flows from Putu's heart and hands transferring positive thoughts and love. Embrace the beauty of this sacred healing experience. Take an afternoon 'air nap' suspended from the ceiling of the bamboo Dharma Shanti Bale in a 100% pure silk hammock, literally cocooned in the tranquility of the Sayan Valley. Feel your entire body relax and rock gently to sleep in the womb-like cocoon far away from any disturbances. 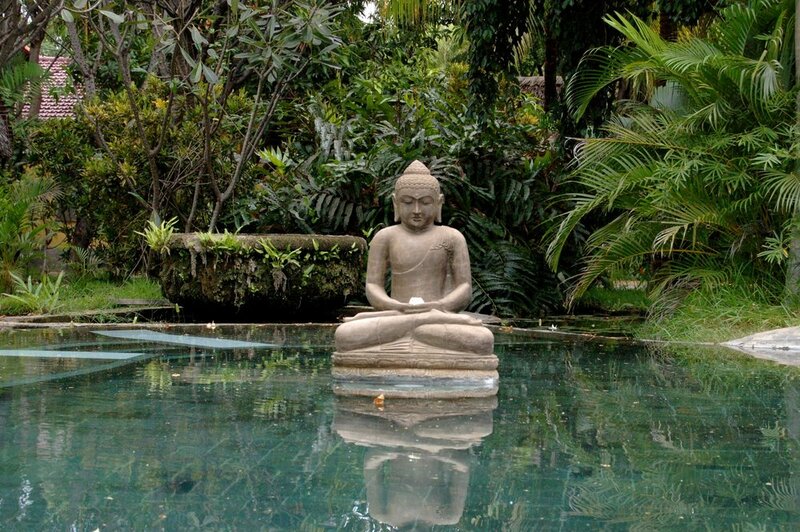 Allow yourself to nod off while listening to the sounds of nature and the life story of Buddha as told by Ibu Fera. Deeply soothing and nurturing, this is a not-to-be-missed relaxation technique that will leave you feeling refreshed and recharged, and planning your next air nap. Ananda means joy or bliss, the happiness that is sought in all human feelings and desires. According to Tantra Yoga philosophy, ananda is achieved by illuminating the soul with the radiance of Divine Love within. In this session, Acarya Vibhakarananda Avt. ("Dada"), an enlightened Balinese spiritual teacher, will share insightful teachings based on the ancient philosophy of Tantra (one’s expansive journey into ananda) and a powerful meditation practice for invigorating the mind and soul with compassionate love and devotion. This is an informative session intended to share useful tools for creating greater peace, harmony and happiness in your daily life. Dada is a warm and compassionate man devoted to a path of love. He began searching for spiritual answers as a young child, and after several years working in the corporate world, Dada’s strong vision for One-ness led him to leave his job and immerse himself in the path of yoga. He went on to pursue training in India as asanyasin, senior yoga monk. He then began teaching yoga and meditation in Taiwan and Australia and eventually returned to his native island of Bali, bringing his devotional work home. Dada is a gifted teacher of the heart whose commitment to share the wisdom of Tantra continues to support people through gentle transformation and the awakening experience of ananda. A native from the nearby island of Nusa Penida, Wayan was initiated into energy healing by his Balian father at a young age. Beginning with a prayer and meditation, Wayan works to balance buana alit, the microcosm, or five elements of earth, water, fire, air and ether within the body. He then channels a connection with buana agung, the macrocosm, or five elements of the universe, joining them to create a powerful harmony. During this treatment, Wayan’s hands pass over your body, responding to and clearing any unhealthy energy originating from the source of emotional and mental burdens and physical ailments. With the help of a translator, Wayan is able to explain what he experienced during your session and offer suggestions related to your health and wellbeing. 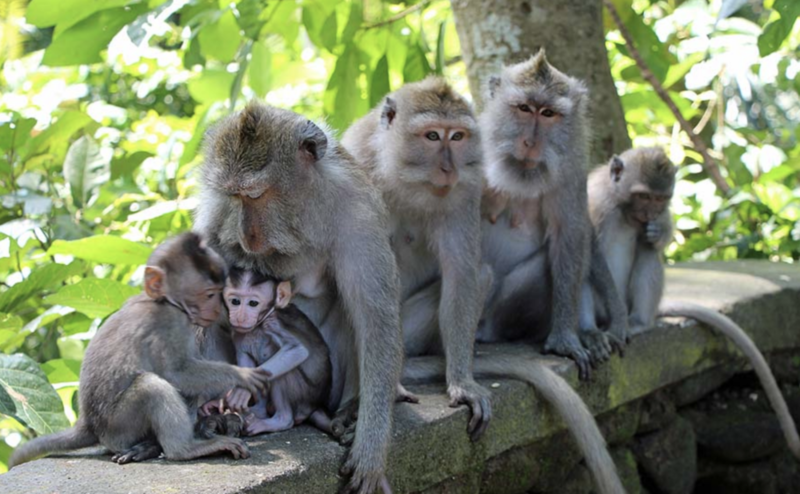 Ubud’s monkey forest is certainly the town’s most popular tourist attraction. As the name suggests, the forest is a natural reserve, home to some 600 monkeys that climb its trees, as free as monkeys can be. Many monkey species live there but each one has its own territory in the reserve. -Do NOT look the monkeys in the eyes because they think you’re provoking them. -Keep your things with you and make sure to close your backpack, purse, etc. Monkeys are curious creatures; if they spot something lying around, or if they see something shiny or that has a bright color, they will steal it. -Avoid touching the monkeys, especially young ones. You might think it’s obvious but it’s something people need to be reminded of. Mother monkeys can be around and will barge in to protect their young. -Avoid giving monkeys food, apart from the bananas that are sold on the spot. It disrupts their wilderness and they can become aggressive or even dependent upon external food sources. Rudraksha beads are renowned for their unique vibration and are commonly worn by Balinese as protection against negative energies. In this powerful and effective meditation, you will use a 'mala' string of prayer beads made from rudraksha to count a sacred mantra, guided by Ibu Fera. Surrounded by the beauty of nature at Dharma Shanti Bale, you will begin with a short prayer to free the mind from distractions and continue with a chosen mantra that suits your faith and purpose in life. Located in Ubud, this ridgewalk is a nice way to start a morning. The Campuhan Ridgewalk is just 10 to 15 minutes away from most resorts in Ubud. This walk involves a short staircase to reach the top of the ridge and that is the most difficult part of the entire walk. Once on the ridge, you stroll along the rolling hills with views of green around. The walk only takes about an hour to complete as it is not more than maybe a 1.5-mile round trip. However, in the heat and humidity that is found in Bali, this walk may be a bit gruelling so make sure to pack some water and sunscreen for this stroll. As the sun sets, drop all worries and concerns, even the effort for silence of the mind. Through the process of observing the breath and using rudraksha prayer beads, the mind is purified and brings peace to every cell. As a symbol of gratitude to the universe, we share the joy within our hearts by the ritual of pouring blessed water on Mother Earth while holding the intention of sharing our merits with all sentient beings. The ‘grounding’ root chakra (located in the base of the spine) is our center of security and the foundation of our emotions and actions. The Muladhara ritual is ideal for frequent travelers or during periods of change or disharmony. It combines a cleansing Balinese kemenyan smoke ceremony, soothing singing bowls and deep slow massage using locally grown ginger and cinnamon, blended with vetivert, patchouli and jatamansi oils. Bali's most famous temples and historical sites are often crowded, yet the island still harbours many sites that are off the beaten track. Experience a sense of discovery with our knowledgeable guides, who share the village's secrets exclusively with Four Seasons guests. Enjoy a scenic drive through a rice farming village along narrow, picturesque roads winding through untouched landscapes. See locals go about their lives as though it were centuries ago. Visit an enormous sacred banyan tree, and a preserved historic house to learn the unique principles of Balinese architecture. Bathe in the holy springs of a secluded water temple where you will make an offering and be blessed by the village priest. Return to the Resort invigorated with the renewed hope that not all the best places have already been discovered. “Meditation and mindfulness are realistic ways of addressing all sorts of stresses,” Fera explains. “It’s a free, easily and accessible method that goes straight to the root of the problem.” It echoes the Spa’s Balinese healing philosophy: evoking a sense of spiritual connection powerful enough to affect physical change. A former Buddhist nun who studied the Dharma in monasteries across Asia, Fera leads complimentary meditation classes twice daily and hosts a series of Life Talks at the Resort each week. Her teachings centre on helping individuals explore ways in which they can integrate mindfulness into their daily lives, enabling them to connect more closely within themselves. Guests report feeling an immediate connection with Fera, who gently guides all she encounters to further understand and develop their emotional and spiritual intelligence, and to "wake up" the greater peace inherent in each and every one of us. Life Talks include topics like the Secret to Happiness, Love and Compassion, Finding Inner Peace and Managing Stress. Here, guests can explore everyday issues and how to overcome them with peace and presence of mind. Each 60-minute class can either be enjoyed as a group. The practice to help you walk with presence and peace of mind and develop the skill of observation with mindfulness in every step. Tour Kintamani from the start at Mount Batur's volcanic crater with an expert guide giving you insights into Bali's history or venture off the beaten track on the Bongkasa Village tour. 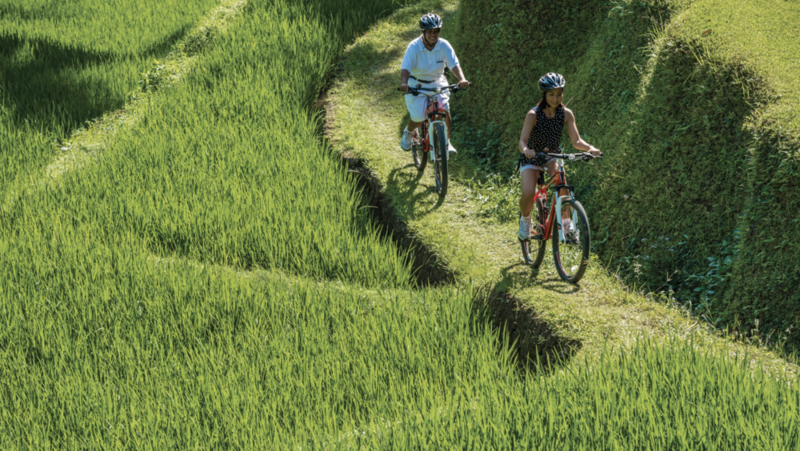 Bike through lush vallies, past centuries-old temples and near the famous Gunung Raung – one of the most active volcanoes in Indonesia. During the day, you may want to go into Ubud to explore, seek the council of a Balinese Healer, or do some shopping. The Four Seasons also offers many spa treatments and various chakra healing sessions that are not included in this itinerary. A meditative Buddhist chant to beautify one’s heart with loving kindness and radiate the wave of love to all sentient beings. Zen Hideaway is a perfect place if you are looking for serenity and peace, enabling you to enjoy the fresh air and view of Ubud. The swing is hanging between coconut trees, high atop a hill, which offers you spectacular experience. As well as Ayung River view, a mini waterfall, rice fields and Mount Agung makes your swing ride thrilling yet addictive. The price for entrance fee usually is 250.000 IDR per person (about $18). This is a unique and special experience that is truly authentic. A short trip across the Badung strait from Bali, Nusa Penida is a world apart. Though separated from the larger island by strong currents half of the year, Nusa Penida has long played an integral role in the spiritual life of the Balinese. Traditionally seen as having strong ties to the underworld, the steep cliffs and mountainous terrain of this limestone island are closer to the dry rocky terrain of Lombok and eastern Indonesia than to that of Bali. Now famous for its vibrant seaweed farming culture, as the home of a bird and wildlife sanctuary, and as a spiritual pilgrimage destination, most Balinese will visit Nusa Penida at least one time every ten years. Join one of our Fivelements guides as we board a speedboat in Padangbai for the journey across the strait with Mount Agung watching over our crossing. Meet with Mangku Ketut Darma at his home for a discussion of Balinese spirituality. Then, Mangku Darma will be our guide on a ritual walk through the Goa Giri Putri, the cave temple, said to be a womb from which spiritual pilgrims are re-born. We will stop at sacred sites along the way for blessings, ritual cleansing and a short meditation at the heart of the cave. In the afternoon, following a Balinese picnic prepared from our Fivelements Sakti kitchen, you are free to enjoy the rest of what the island has to offer with the help of your guide. See local co-operatives where women collect and dry seaweed for export, visit a breeding program for rare and endangered birds, or continue your pilgrimage with visits to the temples of Ped, famous for their white stone architecture. Before the sun sets behind Mount Agung we will be on a boat again, headed back to the Island of the Gods. Lempuyang Temple is an older temple in East Bali and located on Mount Lempuyang. There are a total of seven temples in this complex yet everyone tends to go to the first one, the “Gateway to Heaven.” We can see why as you’re high up on the mountain overlooking the area! If you have the time and endurance, consider visiting all of the temples for the full experience. -Everyone must wear a sarong. -Women who are on their menstrual cycle cannot enter the temple. -Yoga poses and kissing is not allowed in the temple. Lempuyang Temple is located approximately 70 KM (~44 miles) outside of Ubud. A local guide will meet you at the hotel and show you around to some of the most unique and important Balinese temples near Ubud. Goa Gajah's name is slightly misleading, lending the impression that it's a gigantic dwelling full of elephants. Nevertheless, Goa Gajah 'Elephant Cave' is an archaeological site of significant historical value that makes it a special place to visit. Goa Gajah is located approximately 6 KM (~4 miles) outside of Ubud. Holy water, or Tirta as the Balinese call it has three important purposes. Both locals and visitors are welcome to take part in this self-cleaning process, though you should make sure to abide by the rules and do your best to perform the ritual correctly. There are also lockers and a changing area available. Women should wear a shirt, preferably one that covers the shoulders and is not see through when wet. Tirta Empul is located near the small village of Tampak Siring located approximately 15 KM (~9 miles) outside of Ubud. One of Bali’s best-kept secrets, Mengening temple is a natural wonderland that every traveler to Bali should explore. Pura Mengening Tampak Siring is near to the more popular Tirta Empul, however is much quieter and sees very few tourists. The serenity of the temple makes a welcome respite from the busier, more popular ones. This temple with its’ local people, including the children who visit to quietly socialize, clean their bodies and purify their souls displays the joy of life that you so often see among the Balinese people. The women's pool is separate to the men's pool, each having their own set of purifying spouts plus a natural fall of water. In the men's pool however it is worth a quick visit to see the waterfall they are required to stand under for their final stage of the cleansing process. Pura Mengening Tampak is located near the small village of Tampak Siring located approximately 15 KM (~9 miles) outside of Ubud. Gunung Kawi Temple complex, locally referred to as Pura Gunung Kawi, is one of Bali’s most unique and most awe-inspiring archaeological sites, comprising a collection of ancient shrine reliefs carved into the face of a rock cliff. This Balinese temple is built into a steep valley overlooking the Pakserian River. Just up the road, this river also snakes its way past the sacred Pura Tirta Empul. More than 100 steps will lead you through the temple where you will find dozens of ancient shrines and alters dating back to the 11th century. The lush landscape is made even more spectacular by the green rice paddies and moss covered statues that dominate this temple complex. Gunung Kawi is located near the small village of Tampak Siring located approximately 15 KM (~9 miles) outside of Ubud. If you choose the Singapore extension, you will depart for Singapore this evening at 8pm (local time) and arrive around 10:40pm (local time). If you choose to end your trip and return home, your flight will depart at 8pm and arrive home in CMH around 11:55am on May 23. Spend the day exploring the many gardens, sculptures and bridges in this unique park in the heart of Singapore. *transportation to/from the Gardens is not included. Visit Gardens by the Bay in Singapore with this admission ticket that includes convenient transport from your hotel. Home to more than 250,000 plants, as well as pavilions, waterways and the spectacular Super Trees, Gardens by the Bay is one of Singapore’s most beautiful outdoor attractions, where you can stroll leisurely through various landscapes that represent diverse ecosystems. See one of the world’s tallest indoor waterfalls in the Cloud Forest conservatory, and admire views of Marina Bay from the Flower Dome conservatory. This day can be fully customized to your interests. 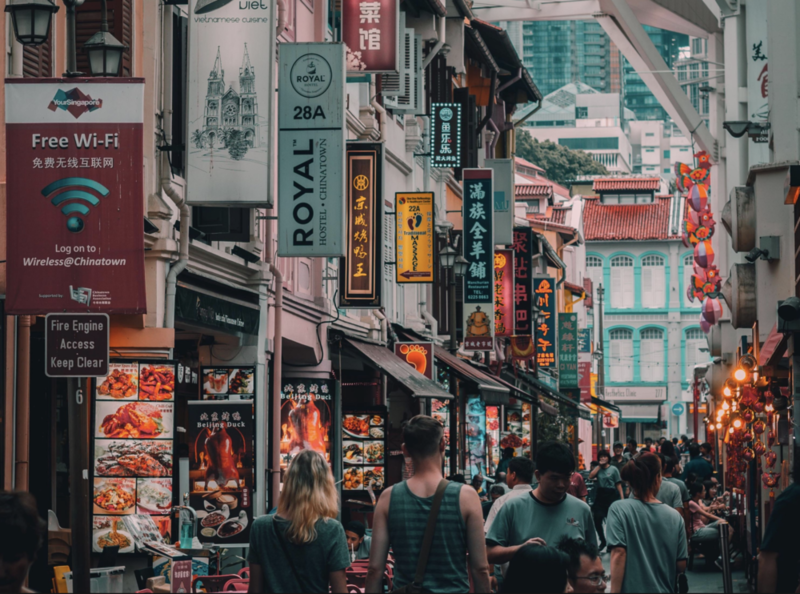 Explore the local food, culture, shopping and sites made famous by the movie “Crazy Rich Asians”. Your flight will depart around 11:35pm (local time) - allowing for some last minute exploration to your favorite spots (or the locations you couldn’t get to the days prior). You will arrive in CMH around 11:55am on May 26. Float above treetops on a dramatic suspension bridge and cross into a different world. With locally inspired experiences and rice bowl-shaped architecture set against the lush Ayung River Valley, our Resort takes you closer to the heart and soul of Bali. Just 15 minutes from Bali’s artistic and energetic hub Ubud, Four Seasons Resort Bali at Sayan is tucked away in the island’s idyllic central highlands, along the Ayung River. Fivelements, Bali opened in late 2010 as the first of a new genre of wellness destinations bridging the wisdom of traditional healing cultures with innovative wellness concepts. To date, the eco-wellness retreat has been recognized with eighteen international awards spanning across hotel, wellness, spa, culinary and sustainable design industries. Fivelements has earned its position as an innovative leader in wellness concept design, retreats and programs, plant-based innovative cuisine and wellness hospitality worldwide. Combined with these traditional therapies are Plant-based cuisine nutrition and transformative Sacred Arts programs. The Panca Mahabhuta (five elements) Retreat is our signature program that comprises a holistic integrative approach designed to tune in on the physical, emotional and spiritual levels, allowing an organic healing process to naturally unfold. This begins by attuning to your authenticity and honoring your highest potential. This would be an excellent way to wind down your journey, before returning home. You will have met with Irene O’Neill prior to your trip and set up goals and strategies. She will be available to you via email, while you are in Bali. Now that you have returned home, you are not alone- your journey will continue. 4 months coaching to resume upon your return. Two 1hr sessions each month with email support in between and exploratory assignments for accountability to help deepen the learning from each session. For several years it has become the “in thing” for tourists to pay a visit to a healer during their holiday in Bali. With the release of the film based on the wildly popular book, “Eat Pray Love,” in August 2010, the demand exceeded all boundaries. I have been told that the top hotels in the Ubud area are expected to know directions to the home of the person featured in the book. But how many of these tourists bother to learn even the protocol regarding such a visit, or learn even the most basic Indonesian language in order to greet them? I have been asked to translate for visitors to Balians by those who landed in Bali two days prior, with no background in Bali-Hindu culture or religion, something the anthropologists and historians have written volumes about. The challenge is how to present what they are hearing and experiencing into a larger context? Balinese trade information about Balians with skill and charisma, because they do not believe in anyone who is a self-proclaimed “healer.” There are bogus practitioners, some of whom are quite famous. Most Balians were “chosen,” and it is not something they chose. Most discovered their gifts in the course of trying to heal themselves. Balians do not advertise, draw attention to themselves or like to be addressed as a Balian, as this can invite jealousy and bad feelings. Balians receive their gifts from the spirit, as well as through study based on Bali Hindu philosophy. They credit this spirit with giving them their gift of healing. Others become Balians through a very long and intensive study and initiation from a well-known healer or high priest or priestess. They are the Balinese equivalent of a “doctor,” who has to follow an etiquette and moral code, not so different from a modern Western doctor. Healers are not regarded as movie stars or celebrities (so don’t treat them like one). There are so many types of healers who work on specific problems, from broken bones to broken hearts, mental disorders to “mysterious” problems, so choose one that is appropriate for you. Typically, Balinese bring an offering to a healer, with a donation of appreciation inside. At the conclusion of the day, the healer dedicates this offering to their spirit in the family temple. Be generous. Balians are regarded a status similar to priest. Consequently, if you visit one, you should show respect by dressing in a sarong and temple scarf. Remember always to give your offering with your right hand, and never point the bottom of your feet at Fe.the healer. Never ever touch their head or face, which is the most sacred part of the body. The internet is littered with blog accounts of those who have gone to see a Balian because they are “curious” or as one woman writes, “A medicine man on the side just seemed unique and adventurous”. Balians are not a side show, and it is unfair to take up their valuable time unless you are genuinely in need of healing. A skimpy sun frock or tattered Bintang singlet is not appropriate attire. Depending on who the healer is, you may need to wear a sarong and temple sash, or at the very least cover your arms and legs. Find out before you go. And don’t point your feet at a Balian, as feet are considered unclean. Balians are not a side show, and it is unfair to take up their valuable time unless you are genuinely in need of healing. Some Balians will only be seen by appointment; others you can just turn up and wait. Again find out before you go. Never hand money direct to a healer. Inquire first if payment is by donation or a fee, and place it in an envelope or a canang (flower offering) and leave it with a member of the family or in the family temple. Balians work with different maladies, so it is best to find one that specializes in your particular ailment, and follow personal recommendations. Healing is a booming industry in Bali, and one which has its fair share of charlatans. Pak Sirkus: Not for the faint-hearted! As the saying goes, “First he hurts you and then you feel better.” Pak Sircus specialises in problems associated with muscles and bones. Jalan Subak Sari, Berawa + 62 361739538. Pak Made Partha: Generally works with vigorous deep-tissue massage, ideal for sports injuries, back problems and sprains. He can also set broken bones. Banjar Bantan Buah, near Ubud + 62 81338430224. Cokorda Bagus Astawa: A traditional Balinese healer who specialises in readings and mystical illnesses. He works with herbal tinctures and massage and energy healing to remove blocks. Pak Man: One of the island’s better-known energy healers, Pak Man mostly works with healing massage and makes his own medicinal oils. He treats everything from depression to diabetes, drug addiction, black magic and broken bones. Ida Resi Alit: Bali’s youngest high priestess can be found in Bangli and offers ritual water purification ceremonies that will leave you feeling spiritually cleansed. Ibu Jero: A high priestess descended from five generations of healers, Ibu Jero specialises in energy cleansing and Balinese shamanic massage. 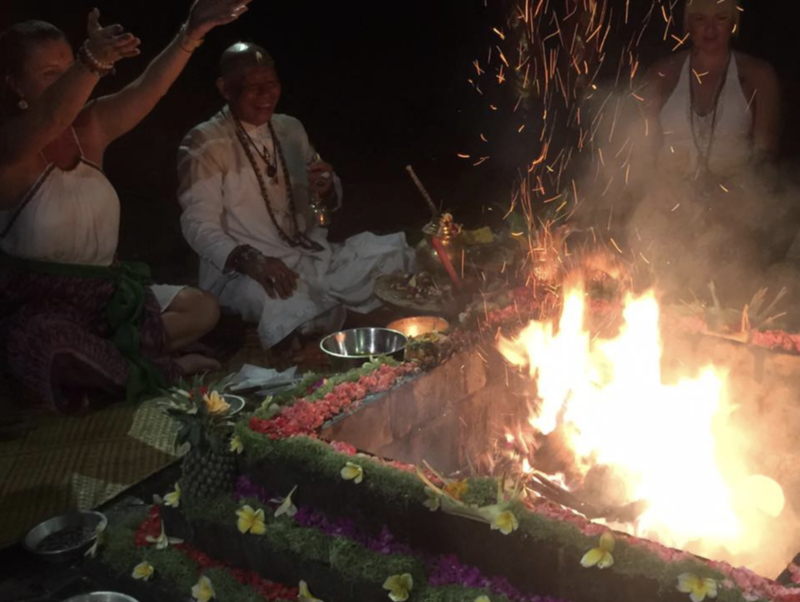 She also offers a healing melukat ceremony which includes a blessing, offering and chakra clearing ritual to cleanse the mind body and spirit. A minimum of five people are required. Fivelements: A serene eco resort in Mambal with several powerful Balinese healers on site, each descended from a long line of healers. Chakra balancing sessions with Pak Dewa are particularly powerful. Floating Leaf: Specializes in customized retreats, including a five-day transformational healing retreat that incorporates a purification ritual, healing blessing ceremony, and session with a Balinese healer specifically chosen according to your particular ailment. The high season for tourist to Bali is in July and August. The second busiest period to visit in then from Christmas to New Year’s Eve. The best time to visit Bali is May, June, September therefore around the busy period, but avoiding the rainy season which is October to April. The rain season is typically a monsoon season which can mean strong winds and heavy rain. Bali is a part of Indonesia; for this reason, the official (and dominant) language is Indonesian. However, you'll still hear Balinese (a Malayo-Polynesian language) being spoken by some locals. Because international tourism plays a key role in Bali's economy, English is widely spoken in larger towns and cities. That means you shouldn't have a problem getting around, purchasing souvenirs or ordering food. The currency in Bali is the Indonesian rupiah. Since the rupiah to U.S. dollar exchange rate fluctuates, be sure to check what the current exchange rate is before you go. Also, keep in mind that because the large numerical difference can be confusing for foreigners, locals sometimes ask for unreasonable prices and can trick travelers into coughing up more cash than they need to. For reference, $1 is equal to approximately 14,330 rupiah. Read the article above for important information. Also- Always put your hand above the keypad when typing your code. ALWAYS! Tipping in Bali is considered to be a foreign concept. Although it isn’t mandatory to tip for every service you avail, the tips are nevertheless appreciated. On the other hand it is important you understand that workers in the service industry are paid extremely low wages, with the bulk of the earnings going into the owner’s pocket. You might just make someone’s day by tipping him/her for the services offered when you’re visiting Bali. In light of this mentioned below is a detailed tipping guide highlighting what you need to know about how to tip for different services. Your U.S. passport must be valid for at least six months from when you enter the country and have at least two blank passport pages. 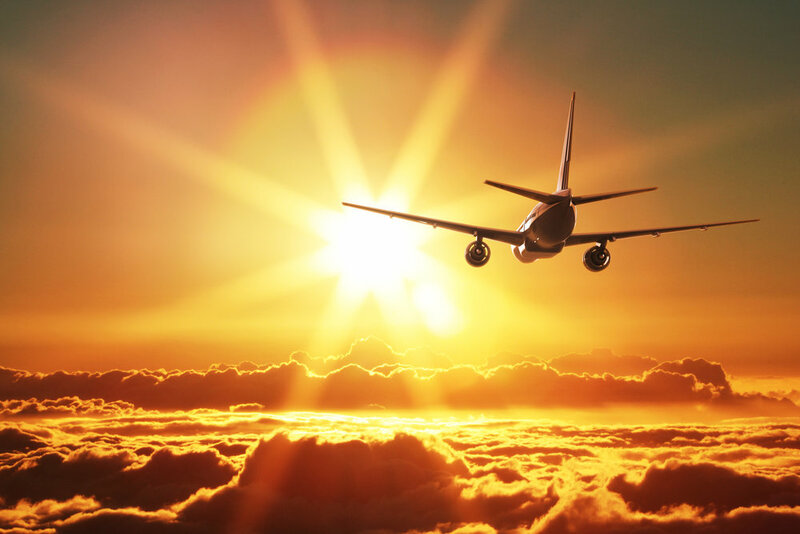 Upon arrival, you must obtain a visa exemption or a 30-day visitor visa upon arrival at the airport in Bali for $35. The visa exemption allows tourists in the country for up to 30 days (and absolutely no longer); the temporary visa applies to tourist and short business trips only and can be extended if necessary. While there are no required vaccinations to visit Bali, we do recommend reviewing this link and considering some vaccinations. Most resorts in the area organize transportation from the airport (DPS) to the resort. If not, we will arrange transportation on your behalf. The transportation from DPS to Ubud takes approximately 1 hour, but upwards of 2 hours if the traffic is bad. Which, more than likely it will be. Dress modestly before entering a temple in Bali. Temple guests are expected to wear shirts that cover shoulders and part of the upper arms. The waist and legs should be covered by a temple scarf (known as a selendang) and a sarong (known locally as kain kamben) respectively. Try to take short showers and avoid wasting water. Everything you throw away stays on Bali or will be washed into the sea. Affective rubbish management in this part of the world is not really existing. Plastic is problem no. 1. Avoid plastic bottles, straws, plastic bags when shopping. Most workers you will meet have a salary of around 130 to 150US$ per month and work hard for their money, travel long distances and share their income with other family members. Balinese are super friendly and welcoming. They are also proud and are happy if you respect their customs and island. Being angry and shouting is not appreciated. If you have a complaint, be polite, calm and insist on a solution in a friendly manner if you wish to get any result. If you're shopping at any one of Bali's markets, bargaining with street vendors is a must. But it's also nice to respect and value their work, effort, and services, and to pay fair prices. Live and let live! We can certainly arrange private transportation and driver for you throughout Bali, and even for your day trip excursions. We’ve found this to be a safe and secure option, leaving little to question including where and how to find a driver on the spot, and how to calculate driving fees. The most honest taxis in Bali are the blue taxis marked "Bali Taxi" (known as Blue Bird Taxis); everybody else is hit or miss. Take the traffic situation into account. Bali's traffic seems to get worse by the week, particularly fares from the airport. Look up possible detours before getting in the taxi. Explain your preferred route to the driver, if you have one. Make sure the driver uses the meter; say so at the beginning of the trip. If he doesn't use the meter, he may just be getting ready to gouge you at the end of the trip. If he refuses to use a taxi or makes an excuse, get out and hail another cab. If the taxi driver offers to wait for you at your destination, consider it. Some places do not get a lot of taxi service, so it might be handy to have a ride ready for you when you're set to leave. Agree beforehand if you want him to keep the meter running while he waits, or if he's willing to settle for an hourly fee. IDR 50,000 (about US$4) is a good upper limit. Scooters are really popular in Indonesia, and you can rent one for a day for around 30,000-50,000 IDR (just a few dollars!) Lots of tourists ride them and no one travels all that fast. Saying that, there are accidents frequently and police crack down on tourists who aren’t obeying the rules. The taxi service, Uber works in Ubud and generally works out significantly cheaper than local taxis. Locals haven’t embraced the service, and as a result they’re not permitted in some areas. You may have to choose a pick up location away from major hotels or shops. Drink a lot of water to avoid getting heatstroke… just don’t get your water from the tap. Bali tap water is often blamed for many a bad case of “Bali belly,” so avoid it entirely. Stick to canned drinks or bottled water. I can highly recommend the Grayl Purifier. This is what I use when I travel - and I travel to some pretty out of the way places. This is hands down the best (and easiest) filter on the planet. REMEMBER- even the water you brush your teeth with, needs to be purified or bottled water. Most resorts have a purification system, but I never trust that it’s clean enough. Ice cubes in restaurants are generally safe and government controlled. Bali’s drug laws are very strict and should not be trifled with. Indonesian Law No. 35/2009 lays down harsh penalties for drug users caught with Group 1 drugs like marijuana, heroin, and cocaine: you can get life imprisonment for possession or the death penalty if you’ve been convicted of trafficking in drugs. Pro Tip: Parts of Kuta (in the south of Bali) are still rife with drug dealers, or narcotics officers pretending to be dealers. Tourists walking through often get whispered solicitations for drugs. If you get one of these whispered sales pitches, walk away. You might end up a hapless victim of a drug sting! Sidewalks can have large and deep holes, that can’t be seen at night. Night swimming (under the influence of alcohol and drugs) seems like fun, but will most likely lead to Bali being your last destination. Balinese are open-minded but they don’t like disrespectful and loud behavior, somebody touching their head, overly public display of affection. Use mosquito net and repellent when possible. Dengue fever is widespread. I highly recommend Sawyer Picardin lotion (not the spray). This can be purchased online or at REI or Cabella’s. We found that 1 bottle (when applied once, daily) lasted about 2 weeks. Since 2002, Indonesian police and security forces have disrupted a number of terrorist cells. Although extremists in Indonesia continue to aspire to carry out violent attacks against Indonesian and Western targets, police have arrested more than 1,700 individuals on terrorism-related charges since 2002 and have greatly reduced the capacity of domestic terrorist organizations. Extremists may target both official and private establishments, including hotels, bars, nightclubs, shopping areas, restaurants, and places of worship. Whether at work, pursuing daily activities, or traveling, you should be aware of your personal safety and security at all times. Recent incidents of extremist violence include the May 2018 bomb attacks against three churches in Surabaya that killed 15 civilians and injured 50 more, and an attack in January 14, 2016, by terrorists using guns and explosives attacked near the Sarinah Plaza in Central Jakarta, which killed four civilians, including one foreigner, and injured 17 others. In 2002, more than 200 foreign tourists and Indonesian citizens were killed by a bomb in Bali’s nightclub district. Demonstrations are very common in Jakarta, Surabaya, and other large cities, but less common in Bali. You should avoid demonstrations and other mass gatherings, since even those intended to be peaceful can become violent. Demonstrations may become more frequent ahead of the Indonesian general elections scheduled for April 2019. Currently, travel by U.S. government personnel to the provinces of Central Sulawesi and Papua is restricted to mission-essential travel that is approved in advance by the Embassy security office. Crime: Pick-pocketing, theft, armed car-jacking, and residential break-ins are common. Avoid traveling to isolated areas late at night. Beware of your surroundings, particularly vehicles or individuals that might be following you. Use a reputable taxi company or hire a taxi either at a major hotel or shopping center. Travelers have been robbed in taxis that have been painted to look like legitimate taxis. Credit card fraud is a serious and growing problem in Indonesia. Avoid using credit cards when possible. Criminals have “skimmed” credit/debit cards to access and drain bank accounts. Use an ATM in a secure location and check the machine for evidence of tampering. Monitor your account statements regularly. Tourists and Indonesians have suffered from serious illness and have even died from "drink-spiking” and drink poisoning incidents, particularly in clubs and nightspots in urban and tourist areas. Victims of Crime: Victims of sexual assault should seek prompt medical assistance, contact the Embassy, and call the local police at 112. For a criminal investigation to be initiated by the police, the victim must make a full statement to the local police, in person. See the webpage on help for U.S. victims of crime overseas. Due to the rapidly approaching travel date, payment must be made in full to secure the availability and pricing.